The firm's primary operating subsidiary is national bank Wells Fargo Bank, N.A., which designates its main office as Sioux Falls, South Dakota. Wells Fargo in its present form is a result of a merger between San Francisco–based Wells Fargo & Company and Minneapolis-based Norwest Corporation in 1998 and the subsequent 2008 acquisition of Charlotte-based Wachovia. Following the mergers, the company transferred its headquarters to Wells Fargo's headquarters in San Francisco and merged its operating subsidiary with Wells Fargo's operating subsidiary in Sioux Falls. Along with JPMorgan Chase, Bank of America, and Citigroup, Wells Fargo is one of the "Big Four Banks" of the United States. As of June 2018[update], it had 8,050 branches and 13,000 ATMs. In 2018 the company had operations in 35 countries with over 70 million customers globally. In February 2014, Wells Fargo was named the world's most valuable bank brand for the second consecutive year in The Banker and Brand Finance study of the top 500 banking brands. In 2016, Wells Fargo ranked 7th on the Forbes Magazine Global 2000 list of largest public companies in the world and ranked 27th on the Fortune 500 list of the largest companies in the US. In 2015, the company was ranked the 22nd most admired company in the world, and the 7th most respected company in the world. As of December 2018[update], the company had a Standard & Poors credit rating of A−. However, for a brief period in 2007, the company was the only AAA‑rated bank, reflecting the highest credit rating from two firms. On February 2, 2018, the US Federal Reserve Bank barred Wells Fargo from growing its nearly US$2 trillion-asset base any further, based upon years of misconduct, until Wells Fargo fixes its internal problems to the satisfaction of the Federal Reserve. In April 2018, The Wall Street Journal reported that the US Department of Labor had launched a probe into whether Wells Fargo was pushing its customers into more expensive retirement plans as well as into retirement funds managed by Wells Fargo itself. Subsequently in May 2018, The Wall Street Journal reported that Wells Fargo's business banking group had improperly altered documents about business clients in 2017 and early 2018. In June 2018, Wells Fargo began retreating from retail banking in the Midwestern United States by announcing the sale of all its physical bank branch locations in Indiana, Michigan, and Ohio to Flagstar Bank. The company operates 12 museums, most known as a Wells Fargo History Museum, in its corporate buildings in Charlotte, North Carolina, Denver, Colorado, Des Moines, Iowa, Los Angeles, California, Minneapolis, Minnesota, Philadelphia, Pennsylvania, Phoenix, Arizona, Portland, Oregon, Sacramento, California and San Francisco, California. 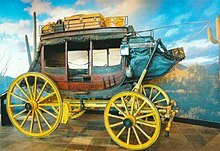 Displays include original stagecoaches, photographs, gold nuggets and mining artifacts, the Pony Express, telegraph equipment and historic bank artifacts. The company also operates a museum about company history in the Pony Express Terminal in Old Sacramento State Historic Park in Sacramento, California, which was the company's second office, and the Wells Fargo History Museum in Old Town San Diego State Historic Park in San Diego, California. 1852: Henry Wells and William G. Fargo, the two founders of American Express, formed Wells Fargo & Company to provide express and banking services to California. 1905: Wells Fargo separated its banking and express operations; Wells Fargo's bank was merged with the Nevada National Bank to form the Wells Fargo Nevada National Bank. 1918: As a wartime measure, the US Federal Government nationalized Wells Fargo's express franchise into a federal agency known as the US Railway Express Agency. The US Federal Government took control of the express company. The bank began rebuilding but with a focus on commercial markets. After the war, REA was privatized and continued service until 1975. 1982: Northwest Bancorporation acquired consumer finance firm Dial Finance which is renamed Norwest Financial Service the following year. 1983: Northwest Bancorporation was renamed Norwest Corporation. 1983: White Eagle, largest US bank heist to date took place at a Wells Fargo depot in West Hartford, Connecticut. 1995: Wells Fargo became the first major US financial services firm to offer Internet banking. 1996: Wells Fargo acquired First Interstate Bancorp for US$11.6 billion. 2001: Wells Fargo acquired H.D. Vest Financial Services for US$128 million, but sold it in 2015 for US$580 million. 2007: Wells Fargo acquired Greater Bay Bancorp, which had US$7.4 billion in assets, in a US$1.5 billion transaction. On October 3, 2008, Wachovia agreed to be bought by Wells Fargo for about US$14.8 billion in an all-stock transaction. This news came four days after the US Federal Deposit Insurance Corporation (FDIC) made moves to have Citigroup buy Wachovia for US$2.1 billion. Citigroup protested Wachovia's agreement to sell itself to Wells Fargo and threatened legal action over the matter. However, the deal with Wells Fargo overwhelmingly won shareholder approval since it valued Wachovia at about seven times what Citigroup offered. To further ensure shareholder approval, Wachovia issued Wells Fargo preferred stock that holds 39.9% of the voting power in the company. On October 4, 2008, a New York state judge issued a temporary injunction blocking the transaction from going forward while the situation was sorted out. Citigroup alleged that they had an exclusivity agreement with Wachovia that barred Wachovia from negotiating with other potential buyers. The injunction was overturned late in the evening on October 5, 2008, by New York state appeals court. Citigroup and Wells Fargo then entered into negotiations brokered by the FDIC to reach an amicable solution to the impasse. Those negotiations failed. Sources say that Citigroup was unwilling to take on more risk than the US$42 billion that would have been the cap under the previous FDIC-backed deal (with the FDIC incurring all losses over US$42 billion). Citigroup did not block the merger, but indicated they would seek damages of US$60 billion for breach of an alleged exclusivity agreement with Wachovia. On October 28, 2008, Wells Fargo was the recipient of US$25 billion of Emergency Economic Stabilization Act funds in the form of a preferred stock purchase by the US Treasury Department. Tests by the US Federal Government revealed that Wells Fargo needed an additional US$13.7 billion in order to remain well capitalized if the economy were to deteriorate further under stress test scenarios. On May 11, 2009, Wells Fargo announced an additional stock offering which was completed on May 13, 2009, raising US$8.6 billion in capital. The remaining US$4.9 billion in capital was planned to be raised through earnings. On Dec. 23, 2009, Wells Fargo redeemed the US$25 billion of preferred stock issued to the US Treasury. As part of the redemption of the preferred stock, Wells Fargo also paid accrued dividends of US$131.9 million, bringing the total dividends paid to US$1.441 billion since the preferred stock was issued in October 2008. In 2009, Wells Fargo ranked #1 among banks and insurance companies, and #13 overall, in Newsweek Magazine's inaugural "Green Rankings" of the country's 500 largest companies. In 2013, the company was recognized by the EPA Center for Corporate Climate Leadership as a Climate Leadership Award winner, in the category "Excellence in Greenhouse Gas Management (Goal Setting Certificate)"; this recognition was for the company's aim to reduce its absolute greenhouse gas emissions from its US operations by 35% by 2020 versus 2008 levels. We want to be as open and clear as possible about our environmental efforts – both our accomplishments and challenges – and share our experiences, ideas and thoughts as we work to integrate environmental responsibility into everything we do," said Mary Wenzel, director of Environmental Affairs. "We also want to hear and learn from our customers. By working together, we can do even more to protect and preserve natural resources for future generations. Wells Fargo delineates three different business segments when reporting results: Community Banking; Wholesale Banking; and Wealth, Brokerage and Retirement. The Community Banking segment includes Regional Banking, Diversified Products, and Consumer Deposits groups, as well as Wells Fargo Customer Connection (formerly Wells Fargo Phone Bank, Wachovia Direct Access, the National Business Banking Center, and Credit Card Customer Service). Wells Fargo also has around 2,000 stand-alone mortgage branches throughout the country. There are mini-branches located inside of other buildings, which are almost exclusively grocery stores, that usually contain ATMs, basic teller services, and, space permitting, an office for private meetings with customers. In March 2017, Wells Fargo announced a plan to offer smartphone-based transactions with mobile wallets including Wells Fargo Wallet, Android Pay and Samsung Pay. As of Q3 2011, Wells Fargo Home Mortgage was the largest retail mortgage lender in the United States, originating one out of every four home loans. Wells Fargo services US$1.8 trillion in home mortgages, the second largest servicing portfolio in the US It was reported in 2012 Wells Fargo reached 30% market share for US mortgages, however, the then-CEO John Stumpf had said the numbers were misleading because about half of that share represented the aggregation of smaller loans that were then sold on in the secondary market. In 2013, its share was closer to 22%; of which eight percentage points was aggregation. Wells Fargo private student loans are available to students to pay for college expenses, such as tuition, books, computers, or housing. Loans are available for undergraduate, career and community colleges, graduate school, law school and medical school. Wells Fargo also provides private student loan consolidation and student loans for parents. Wells Fargo has various divisions that finance and lease equipment to different types of companies. One venture is Wells Fargo Rail, which in 2015 agreed to the purchase of GE Capital Rail Services and merged in with First Union Rail. In late 2015, it was announced that Wells Fargo would buy three GE units focused on business loans equipment financing. Wells Fargo offers investment products through its subsidiaries, Wells Fargo Investments, LLC and Wells Fargo Advisors, LLC, as well as through national broker/dealer firms. The company also serves high-net-worth individuals through its private bank and family wealth group. Wells Fargo Advisors is the brokerage subsidiary of Wells Fargo, located in St. Louis, Missouri. It is the third largest brokerage firm in the United States as of the third quarter of 2010 with US$1.1 trillion retail client assets under management. In September 2018, Wells Fargo announced to cut 26,450 jobs by 2020 to reduce costs by US$4 billion. Wells Fargo Asset Management (WFAM) is the trade name for the mutual fund division of Wells Fargo & Co. Mutual funds are offered under the Wells Fargo Advantage Funds brand name. Wells Fargo Securities (WFS) is the investment banking division of Wells Fargo & Co. The size and financial performance of this group is not disclosed publicly, but analysts believe the investment banking group houses approximately 4,500 employees and generates between US$3 and US$4 billion per year in investment banking revenue. By comparison, two of Wells Fargo's largest competitors, Bank of America and J.P. Morgan Chase generated approximately US$5.5 billion and US$6 billion respectively in 2011 (not including sales and trading revenue). WFS headquarters are in Charlotte, North Carolina, with other US offices in New York, Minneapolis, Boston, Houston, San Francisco, and Los Angeles, with international offices in London, Hong Kong, Singapore, and Tokyo. A key part of Wells Fargo's business strategy is cross-selling, the practice of encouraging existing customers to buy additional banking products. Customers inquiring about their checking account balance may be pitched mortgage deals and mortgage holders may be pitched credit card offers in an attempt to increase the customer's profitability to the bank. Other banks have attempted to emulate Wells Fargo's cross-selling practices (described by The Wall Street Journal as a hard sell technique); Forbes magazine describes Wells Fargo as "better than anyone" at the practice. Wells Fargo has banking services throughout the world, with offices in Hong Kong, London, Dubai, Singapore, Tokyo, Toronto. They operate back-offices in India and the Philippines with more than 3,000 staff. Illinois Attorney General Lisa Madigan filed suit against Wells Fargo on July 31, 2009, alleging that the bank steers African Americans and Hispanics into high-cost subprime loans. A Wells Fargo spokesman responded that "The policies, systems, and controls we have in place – including in Illinois – ensure race is not a factor..." An affidavit filed in the case stated that loan officers had referred to black mortgage-seekers as "mud people," and the subprime loans as "ghetto loans." According to Beth Jacobson, a loan officer at Wells Fargo interviewed for a report in The New York Times, "We just went right after them. Wells Fargo mortgage had an emerging-markets unit that specifically targeted black churches, because it figured church leaders had a lot of influence and could convince congregants to take out subprime loans." The report goes on to present data from the city of Baltimore, where "more than half the properties subject to foreclosure on a Wells Fargo loan from 2005 to 2008 now stand vacant. And 71 percent of those are in predominantly black neighborhoods." Wells Fargo agreed to pay US$125 million to subprime borrowers and US$50 million in direct down payment assistance in certain areas, for a total of US$175 million. In a March 2010 agreement with US federal prosecutors, Wells Fargo acknowledged that between 2004 and 2007 Wachovia had failed to monitor and report suspected money laundering by narcotics traffickers, including the cash used to buy four planes that shipped a total of 22 tons of cocaine into Mexico. 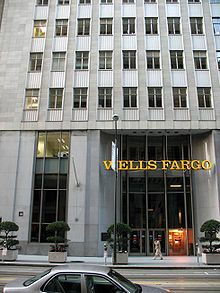 In August 2010, Wells Fargo was fined by US District Court judge William Alsup for overdraft practices designed to "gouge" consumers and "profiteer" at their expense, and for misleading consumers about how the bank processed transactions and assessed overdraft fees. On February 9, 2012, it was announced that the five largest mortgage servicers (Ally Financial, Bank of America, Citi, JPMorgan Chase, and Wells Fargo) agreed to a settlement with the US Federal Government and 49 states. The settlement, known as the National Mortgage Settlement (NMS), required the servicers to provide about US$26 billion in relief to distressed homeowners and in direct payments to the federal and state governments. This settlement amount makes the NMS the second largest civil settlement in US history, only trailing the Tobacco Master Settlement Agreement. The five banks were also required to comply with 305 new mortgage servicing standards. Oklahoma held out and agreed to settle with the banks separately. On April 5, 2012, a federal judge ordered Wells Fargo to pay US$3.1 million in punitive damages over a single loan, one of the largest fines for a bank ever for mortgaging service misconduct. Elizabeth Magner, a federal bankruptcy judge in the Eastern District of Louisiana, cited the bank's behavior as "highly reprehensible", stating that Wells Fargo has taken advantage of borrowers who rely on the bank's accurate calculations. She went on to add, "perhaps more disturbing is Wells Fargo's refusal to voluntarily correct its errors. It prefers to rely on the ignorance of borrowers or their inability to fund a challenge to its demands, rather than voluntarily relinquish gains obtained through improper accounting methods." On August 14, 2012, Wells Fargo agreed to pay around US$6.5 million to settle US Securities and Exchange Commission (SEC) charges that in 2007 it sold risky mortgage-backed securities without fully realizing their dangers. On October 9, 2012, the US Federal Government sued the bank under the False Claims Act at the federal court in Manhattan, New York. The suit alleges that Wells Fargo defrauded the US Federal Housing Administration (FHA) over the past ten years, underwriting over 100,000 FHA backed loans when over half did not qualify for the program. This suit is the third allegation levied against Wells Fargo in 2012. In October 2012, Wells Fargo was sued by United States Attorney Preet Bharara over questionable mortgage deals. In May 2013, Wells Fargo paid US$203 million to settle class-action litigation accusing the bank of imposing excessive overdraft fees on checking-account customers. Also in May, the New York attorney-general, Eric Schneiderman, announced a lawsuit against Wells Fargo over alleged violations of the national mortgage settlement, a US$25 billion deal struck between 49 state attorneys and the five-largest mortgage servicers in the US. Schneidermann claimed Wells Fargo had violated rules over giving fair and timely serving. In February 2015, Wells Fargo agreed to pay US$4 million for violations where an affiliate took interest in the homes of borrowers in exchange for opening credit card accounts for the homeowners. This is illegal according to New York credit card laws. There was a US$2 million penalty with the other US$2 million going towards restitution to customers. With CEO John Stumpf being paid 473 times more than the median employee, Wells Fargo ranks number 33 among the S&P 500 companies for CEO—employee pay inequality. In October 2014, a Wells Fargo employee earning US$15 per hour emailed the CEO—copying 200,000 other employees—asking that all employees be given a US$10,000 per year raise taken from a portion of annual corporate profits to address wage stagnation and income inequality. After being contacted by the media, Wells Fargo responded that all employees receive "market competitive" pay and benefits significantly above US federal minimums. In December 2011, the non-partisan organization Public Campaign criticized Wells Fargo for spending US$11 million on lobbying and not paying any taxes during 2008–2010, instead getting US$681 million in tax rebates, despite making a profit of US$49 billion, laying off 6,385 workers since 2008, and increasing executive pay by 180% to US$49.8 million in 2010 for its top five executives. As of 2014 however, at an effective tax rate of 31.2% of its income, Wells Fargo is the fourth-largest payer of corporation tax in the US. The GEO Group, Inc., a multi-national provider of for-profit private prisons, received investments made by Wells Fargo mutual funds on behalf of clients, not investments made by Wells Fargo and Company, according to company statements. By March 2012, its stake had grown to more than 4.4 million shares worth US$86.7 million. As of November, 2012, the latest SEC filings reveal that Wells Fargo has divested 33% of its dispositive holdings of GEO's stock, which reduces Wells Fargo's holdings to 4.98% of Geo Group's common stock. By reducing its holdings to less than 5%, Wells Fargo will no longer be required to disclose some financial dealings with GEO. In September 2016, Wells Fargo was issued a combined total of US$185 million in fines for creating over 1.5 million checking and savings accounts and 500,000 credit cards that its customers never authorized. The US Consumer Financial Protection Bureau issued US$100 million in fines, the largest in the agency's five-year history, along with US$50 million in fines from the City and County of Los Angeles, and US$35 million in fines from the Office of Comptroller of the Currency. The scandal was caused by an incentive-compensation program for employees to create new accounts. It led to the firing of nearly 5,300 employees and US$5 million being set aside for customer refunds on fees for accounts the customers never wanted. Carrie Tolstedt, who headed the department, retired in July 2016 and received US$124.6 million in stock, options, and restricted Wells Fargo shares as a retirement package. On October 12, 2016, John Stumpf, the then Chairman and CEO, announced that he would be retiring amidst the controversies involving his company. It was announced by Wells Fargo that President and Chief Operating Officer Timothy J. Sloan would succeed, effective immediately. Following the scandal, applications for credit cards and checking accounts at the bank plummeted dramatically. In response to the event, the Better Business Bureau dropped accreditation of the bank, S&P Global Ratings lowered its outlook for Wells Fargo to negative from stable, and several states and cities across the US ended business relations with the company. An investigation by the Wells Fargo board of directors, the report of which was released in April 2017, primarily blamed Stumpf, whom it said had not responded to evidence of wrongdoing in the consumer services division, and Tolstedt, who was said to have knowingly set impossible sales goals and refused to respond when subordinates disagreed with them. The board chose to use a clawback clause in the retirement contracts of Stumpf and Tolstedt to recover US$75 million worth of cash and stock from the former executives. In November 2016, Wells Fargo agreed to pay US$50 million to settle a racketeering lawsuit in which the bank was accused of overcharging hundreds of thousands of homeowners for appraisals ordered after they defaulted on their mortgage loans. While banks are allowed to charge homeowners for such appraisals, Wells Fargo frequently charged homeowners US$95 to US$125 on appraisals for which the bank had been charged US$50 or less. The plaintiffs had sought triple damages under the U S Racketeer Influenced and Corrupt Organizations Act on grounds that sending invoices and statements with fraudulently concealed fees constituted mail and wire fraud sufficient to allege racketeering. Wells Fargo is a lender on the Dakota Access Pipeline, a 1,172-mile-long (1,886 km) underground oil pipeline transport system in North Dakota. The pipeline has been controversial regarding its potential impact on the environment. In February 2017, Seattle, Washington's city council unanimously voted to not renew its contract with Wells Fargo "in a move that cites the bank's role as a lender to the Dakota Access Pipeline project as well as its "creation of millions of bogus accounts." and saying the bidding process for its next banking partner will involve "social responsibility." The City Council of Davis, California, took a similar action voting unanimously to find a new bank to handle its accounts by the end of 2017. In December 2016, the Financial Industry Regulatory Authority fined Wells Fargo US$5.5 million for failing to store electronic documents in a "write once, read many" format, which makes it impossible to alter or destroy records after they are written. Wells Fargo is the top banker for US gun makers and the National Rifle Association (NRA). From December 2012 through February 2018 it reportedly helped two of the biggest firearms and ammunition companies obtain US$431.1 million in loans and bonds. It also created a US$28-million line of credit for the NRA and operates the organization's primary accounts. In a March 2018 statement Wells Fargo said, "Any solutions on how to address this epidemic will be complicated. This is why our company believes the best way to make progress on these issues is through the political and legislative process. ... We plan to engage our customers that legally manufacture firearms and other stakeholders on what we can do together to promote better gun safety for our communities." Wells Fargo's CEO subsequently said that the bank would provide its gun clients with feedback from employees and investors. In June 2018, about a dozen female Wells Fargo executives from the wealth management division met in Scottsdale, Arizona to discuss the minimal presence of women occupying senior roles within the company. The meeting, dubbed "the meeting of 12", represented the majority of the regional managing directors, of which 12 out of 45 are women. Wells Fargo had previously been investigating reports of gender bias in the division in the months leading up to the meeting. The women reported that they had been turned down for top jobs despite their qualifications, and instead the roles were occupied by men. There were also complaints against company president Jay Welker, who is also the head of the Wells Fargo wealth management division, due to his sexist statements regarding female employees. The female workers claimed that he called them "girls" and said that they "should be at home taking care of their children." ^ "2018 annual results" (PDF). Wells Fargo & Company. ^ a b c "Wells Fargo Today (2nd Quarter 2018)" (PDF). Wells Fargo & Company. June 2018. Retrieved December 3, 2018. ^ "Contact Info For Wells Fargo CEO John Stumpf And Friends". September 24, 2008. ^ "Wells Fargo & Company, Form 10-K, Annual Report, Filing Date Mar 1, 2018". secdatabase.com. Retrieved May 13, 2018. ^ Stempel, Jonathan. "Buffett becomes Bank of America's top shareholder". Retrieved September 9, 2018. ^ a b c d "Wells Fargo Q1 earnings report 2018" (PDF). Wells Fargo. 2018. ^ a b "Debt Rating Summary (3rd Quarter 2018)". Wells Fargo & Company. 2018. Archived from the original on December 3, 2018. Retrieved December 3, 2018. ^ "Wells Fargo & Company, Form 10-K, Annual Report, Filing Date Feb 27, 2009". secdatabase.com. Retrieved May 13, 2018. ^ a b Laura J. Keller and Katherine Chiglinsky (September 13, 2016). "Wells Fargo Eclipsed by JPMorgan as World's Most Valuable Bank". Bloomberg L.P. Retrieved September 16, 2016. ^ a b "This is the most valuable bank in the world". Fortune. Retrieved July 24, 2015. ^ a b Hannah Levitt (June 5, 2018). "Wells Fargo sells all its branches in Indiana, Michigan, Ohio". Bloomberg, L.P. Retrieved June 5, 2018. ^ Deon Roberts (July 19, 2018). "Here's another way Wells Fargo is falling behind competitors in the wake of scandals". The Charlotte Observer. Retrieved February 13, 2019. ^ "FRB: Large Commercial Banks-- March 31, 2016". ^ "Wells Fargo Tops List of World's Most Valuable Bank Brands, Leads Strong US Growth". Brand Finance. February 3, 2014. ^ "The Top 500 Banking Brands, 2014". The Banker. February 3, 2014. ^ "Fortune 500 #30: Wells Fargo". Fortune Magazine. Retrieved July 24, 2015. ^ "Wells Fargo Bank Becomes S&P's Only "AAA" Credit-rated U.S. Bank" (Press release). PRNewswire. February 14, 2007. ^ Kate Rooney (April 26, 2018). "Labor Department is reportedly investigating Wells Fargo's 401(k) unit". CNBC. Retrieved April 26, 2018. ^ Matt Egan (May 17, 2018). "Wells Fargo altered documents about business clients". CNN. Retrieved May 17, 2018. ^ Matt Egan (June 5, 2018). "Wells Fargo sells all its branches in three Midwestern states". CNN. Retrieved June 5, 2018. 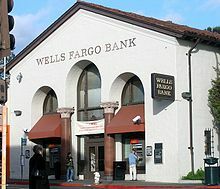 ^ "Museums - Wells Fargo History". ^ "B.F. Hastings Building". California State Railroad Museum Foundation. Archived from the original on February 13, 2015. Retrieved February 24, 2015. 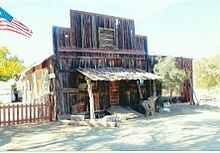 ^ "Old Town State Historic Park i". San Diego History Center. Retrieved February 24, 2015. ^ "Alaska Museum - Wells Fargo History". ^ Lawrence M. Fisher (January 16, 1988). "Wells Fargo to Buy Barclays in California". New York Times. ^ Saul Hansell (January 25, 1996). "Wells Fargo Wins Battle for First Interstate". New York Times. ^ "Wells Fargo and Norwest to Merge". Wellsfargo.com. June 8, 1998. Retrieved March 13, 2012. ^ "Wells Fargo to buy NBA". Juneau Empire. December 22, 1999. ^ "H.D. Vest to be acquired by Internet company Blucora for $580 million". Investment News. October 15, 2015. ^ "Wells Fargo to Acquire CIT's Construction Unit" (Press release). PRNewswire. June 21, 2007. ^ "Wells Fargo, Greater Bay Bancorp Agree to Merge" (Press release). PRNewswire. May 4, 2007. ^ "Wells Fargo Gobbles Up Greater Bay Bancorp". New York Times. May 7, 2007. 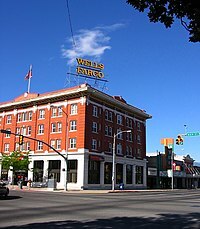 ^ "Wells to acquire United Bancorp of Wyoming". San Francisco Business Times. January 15, 2008. ^ Chad Eric Watt (August 13, 2008). "Wells Fargo to acquire Century Bank". Dallas Business Journal. Retrieved February 2, 2015. ^ "Wells Fargo Acquires North Coast Surety Insurance Services". Reuters (Press release). Business Wire. April 17, 2009. ^ "Wells Fargo to Acquire Merlin Securities, LLC" (Press release). Wells Fargo. April 27, 2012. ^ "Wells Fargo to Buy Prime Brokerage Firm". New York Times. April 27, 2012. ^ "Wells Fargo agrees to buy Wachovia; Citi objects". Associated Press. USA Today. October 4, 2008. Retrieved October 4, 2008. ^ "Court tilts Wachovia fight toward Wells". October 5, 2008. Retrieved October 5, 2008. ^ "Wells Fargo plans to buy Wachovia; Citi ends talks". Associated Press. USA Today. October 9, 2008. Retrieved October 11, 2008. ^ "Capital Purchase Program Transaction Report" (PDF). November 17, 2008. Retrieved January 4, 2009. ^ Landler, Mark & Dash, Eric (October 15, 2008). "Drama Behind a $250 billion Banking Deal". The New York Times. Retrieved February 4, 2009. ^ "News Releases". Wells Fargo. December 18, 2009. Archived from the original on April 6, 2014. Retrieved December 30, 2012. ^ "First Union To Expand Investment Banking Capabilities With Acquisition Of Bowles Hollowell Conner" (Press release). PRNewswire. March 10, 1998. ^ Ahmed, Azam (August 15, 2011). "Date 15 Aug 2011". Dealbook.nytimes.com. Retrieved March 13, 2012. ^ Rothacker, Rick (August 4, 2011). "Wells Fargo Securities to occupy new uptown space | CharlotteObserver.com & The Charlotte Observer Newspaper". Charlotteobserver.com. Archived from the original on November 5, 2011. Retrieved March 13, 2012. ^ "Newsweek: HP top 'green' company". Silicon Valley Business Journal. September 25, 2009. Retrieved May 13, 2018. ^ "2013 Climate Leadership Award Winners". EPA Center for Corporate Climate Leadership. US Environmental Protection Agency. March 1, 2013. Retrieved May 13, 2018. ^ "Wells Fargo mortgage consultant team joins Century 21 Ludecke, Inc". Monrovia Weekly. January 22, 2013. Retrieved May 13, 2018. ^ "Wells Fargo Environmental Forum". Blog.wellsfargo.com. Archived from the original on June 16, 2010. Retrieved June 12, 2010. ^ "Wells Fargo Launches Environmental Stewardship Blog" (Press release). Wells Fargo. April 7, 2010. Retrieved May 13, 2018 – via Business Wire. ^ "A Review of Wells Fargo's Subprime Lending" (PDF). ^ "Click "Wells Fargo In-Store Branches" for a pop-up with this information". Wellsfargo.com. Retrieved December 28, 2014. ^ Romain Dillet (March 27, 2017). "Wells Fargo will let you use Apple Pay and Android Pay to withdraw money". TechCrunch. Retrieved March 29, 2017. ^ "Browser Warning". Wellsfargo.com. Retrieved March 13, 2012. ^ a b "Bank of the Year: How Wells Fargo conquered America". Euromoney. July 2013. ^ "Wells Fargo Private Student Loan Review — NerdWallet". June 9, 2016. Retrieved August 25, 2016. ^ "Wells Fargo Equipment Finance, Inc.: Private Company Information - Bloomberg". www.bloomberg.com. Retrieved May 14, 2018. ^ "Wells Fargo Agrees to Acquire GE's Railcar Leasing Business". Bloomberg.com. September 30, 2015. Retrieved May 14, 2018. ^ Koren, James Rufus. "Wells Fargo buys 3 GE units focused on equipment financing". latimes.com. Retrieved May 14, 2018. ^ Reuters (September 21, 2018). "Wells Fargo Plans To Eliminate Up To 26,450 Jobs By 2020". Huffington Post. Retrieved October 1, 2018. ^ "Warren Buffett Seal of Approval Goes To... Wells Fargo Bankers? Date 11 Apr 2011". Blogs.wsj.com. April 11, 2011. Retrieved March 13, 2012. ^ "Our strategy: How we're going to get there". Wellsfargo.com. Retrieved October 7, 2012. ^ a b Smith, Randall (February 28, 2011). "In Tribute to Wells, Banks Try the Hard Sell". The Wall Street Journal. Retrieved April 4, 2012. ^ a b Touryalai, Halah (January 25, 2012). "The Art Of The Cross-Sell". Forbes. Retrieved April 4, 2012. ^ "International Locations and Contacts – Wells Fargo Commercial". ^ Glazer, Emily (April 13, 2015). "A Look at Wells Fargo's Overseas Expansion". Retrieved August 25, 2016. ^ "Why US banking giant Wells Fargo is creating back-office jobs in India". Firstpost. June 22, 2012. Retrieved October 18, 2017. ^ Riggs, Charles (July 6, 2009). "Wells Fargo's Charter Number (cont'd)". Wells Fargo. ^ Miller, Wilbur R.The Social History of Crime and Punishment in America: An Encyclopedia, SAGE Publications, 2012, page 666. Retrieved September 11, 2018. ^ Anderson, Dave "Sports of The Times; The Maps Boxing Scandal", February 1, 1981. Retrieved September 11, 2018. ^ "Illinois Files Bias Suit Against Wells Fargo". Reuters. Reuters.com. July 31, 2009. Retrieved December 30, 2012. ^ Powell, Michael (June 7, 2009). "Bank Accused of Pushing Mortgage Deals on Blacks". The New York Times. NYTimes.com. Retrieved June 24, 2018. ^ Michael Powell (June 6, 2009). Bank Accused of Pushing Mortgage Deals on Blacks. The New York Times. Retrieved May 4, 2015. ^ Broadwater, Luke (July 13, 2012). "Wells Fargo agrees to pay $175M settlement in pricing discrimination suit". The Baltimore Sun. Retrieved July 13, 2012. ^ Yost, Pete (July 13, 2012). "Wells Fargo settles discrimination case". Associated Press and the Express. ^ Smith, Michael (June 29, 2010). "Banks Financing Mexico Gangs Admitted in Wells Fargo Deal". Bloomberg. Retrieved December 6, 2011. ^ Gelles, Jeff (August 15, 2010). "Consumer 10.0: How Wells Fargo held up debit-card customers". The Philadelphia Inquirer. ^ Numerian (August 12, 2010). "The checking account scam—How Wells Fargo gouged its customers". The Agonist. Retrieved August 15, 2010. ^ "Wells Fargo loses consumer case over overdraft fees". Los Angeles Times. August 10, 2010. ^ "Joint State-Federal Mortgage Servicing Settlement FAQ". NMS. Retrieved June 15, 2015. ^ Schwartz, Nelson D.; Creswell, Julie (February 10, 2012). "Mortgage Plan Gives Billions to Homeowners, but With Exceptions". The New York Times. ^ Hallman, Ben (April 9, 2012). "Wells Fargo Slapped With $3.1 Million Fine For 'Reprehensible' Handling Of One Mortgage". The Huffington Post. Retrieved December 28, 2014. ^ "Scribd". Scribd.com. Retrieved December 28, 2014. ^ Schroeder, Peter (August 14, 2012). "Wells Fargo to pay $6.5 million to settle SEC charges". The Hill. "On The Money" blog. Retrieved August 15, 2012. ^ Raice, Shayndi (October 10, 2012). "U.S. Sues Wells Fargo for Faulty Mortgages". The Wall Street Journal. Retrieved October 10, 2012. ^ "U.S. Accuses Bank of America of a 'Brazen' Mortgage Fraud". The New York Times. October 24, 2012. Retrieved October 26, 2012. ^ "Wells Fargo, QBE Agree on $19.3M Force-Placed Settlement". Property Casualty 360. May 17, 2013. ^ Freifeld, Karen (February 5, 2015). "Wells Fargo to pay US$4 million for violations on credit card accounts: New York". Reuters. Retrieved February 5, 2015. ^ Short, Kevin (October 9, 2014). "Wells Fargo Employee Calls Out CEO's Pay, Requests Company-Wide Raise In Brave Email". The Huffington Post. ^ Schafer, Leo (October 15, 2014). "Schafer: Wells Fargo missed mark after worker requested $10,000 raises for all". Star Tribune. Minneapolis. ^ Portero, Ashley. "30 Major U.S. Corporations Paid More to Lobby Congress Than Income Taxes, 2008–2010". International Business Times. Archived from the original on December 26, 2011. Retrieved 26 December 2011. ^ Christopher Helman. "Wells Fargo - In Photos: The 25 U.S. Corporations That Pay The Highest Taxes". Forbes. ^ Eric W. Dolan (November 10, 2011). "Wells Fargo takes heat over investments in private prison industry". news, commentary. The Raw Story. Archived from the original on November 8, 2012. Retrieved November 8, 2012. The advocacy group Small Business United on Thursday called on Wells Fargo to provide a full accounting of investments related to private prisons and immigrant detention centers. ^ Greenwald, Glenn (April 12, 2012). "Wells Fargo's prison cash cow". Salon.com. Retrieved November 8, 2012. The bailed-out bank has used its taxpayer money to invest in private prisons. ^ Cervantes-Gautschi, Peter (November 2, 2017). "Correction Wells Fargo private prison divestment". National Prison Divestment Campaign. Retrieved November 8, 2012. In a press release dated October 24, 2012, we erroneously stated that Wells Fargo divested 75% of its Geo stock. We regret the error. ^ "Update: 2-Ex-Wells Fargo trader beats SEC insider trading charges". reuters.com. September 14, 2015. Retrieved January 18, 2017. ^ "Ex-Wells Fargo Analyst Settles Insider Trading Case". law360.com. May 28, 2018. Retrieved January 18, 2017. ^ "Wells Fargo fined $185M for fake accounts; 5,300 were fired". Retrieved September 9, 2016. ^ Glazer, Emily (September 9, 2016). "Wells Fargo Fined for Sales Scam". The Wall Street Journal. p. A1. ISSN 0099-9660. Retrieved September 9, 2016. ^ Gandel, Stephen (September 12, 2016). "Wells Fargo Exec Who Headed Phony Accounts Unit Collected $125 Million". Fortune. Retrieved September 13, 2016. ^ Corkery, Michael (September 20, 2016). "Illegal Activity at Wells Fargo May Have Begun Earlier, Chief Says". New York Times. Retrieved September 20, 2016. ^ Roberts, Deon. "Wells Fargo reveals latest post-scandal customer traffic numbers". CharlotteObserver.com. Charlotte Observer. Retrieved December 5, 2016. ^ Roberts, Deon. "Wells Fargo loses Better Business Bureau accreditation". The Charlotte Observer. Charlotte Observer. Retrieved October 28, 2016. ^ "S&P Lowers Outlook on Wells Fargo (WFC) to Negative; Ratings Affirmed". Street Insider. October 18, 2016. Retrieved April 11, 2017. ^ "Massachusetts latest to bar Wells Fargo as underwriter". Reuters. October 18, 2016. Retrieved April 11, 2017. ^ a b Cowley, Stacy; Kingson, Jennifer A. (April 10, 2017). "Wells Fargo to Claw Back $75 Million From 2 Former Executives". The New York Times. Retrieved April 11, 2017. ^ Aubin, Dena (October 31, 2016). "Wells Fargo agrees to $50 million settlement over homeowner fees". Reuters. Retrieved November 10, 2016. ^ Fuller, Emily (September 29, 2016). "How to Contact the 17 Banks Funding the Dakota Access Pipeline". YES! Magazine. ^ Chappell, Bill (February 8, 2017). "2 Cities To Pull More Than $3 Billion From Wells Fargo Over Dakota Access Pipeline". ^ "FINRA fines Wells Fargo, others $14 mln for records' changeable format". Reuters. ^ a b "Wells Fargo is the top banker for the NRA and gunmakers". Bloomberg. March 7, 2018. ^ Roberts, Deon (March 27, 2018). "Wells Fargo is talking to its gun maker clients, CEO says". LA TIMES. ^ Glazer, Emily (August 31, 2018). "At Wells Fargo, Discontent Simmers Among Female Executives". Wall Street Journal. ISSN 0099-9660. Retrieved September 3, 2018. ^ a b c Rooney, Kate (August 31, 2018). "Wells Fargo said to be investigating reports of gender bias in its wealth division". CNBC. Retrieved September 3, 2018. "Deadwood Stage (Whip Crack Away, Calamity Jane) Lyrics". lyricsfreak.com. Retrieved July 6, 2017. "Wells Fargo to purchase Placer Sierra Bank, owner of four Bank of Lodi branches". Lodi News-Sentinel. January 9, 2007. Retrieved July 6, 2017. "Wells Fargo Today Quarterly Fact Sheet for 4th Quarter of 2017" (PDF). Wells Fargo Media. Retrieved March 9, 2018.